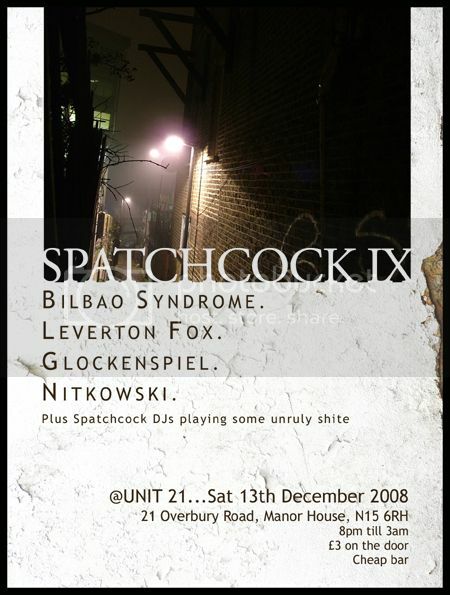 Spatchcock 9, Manor House, LDN, Sat. 13th Dec.
Righto, this'll be the last one before an extended break so we've lined up some extra special derangement. -A bunch of award-winning jazz musicians playing face-smashing tech in the vein of Meshuggah and Fantomas. In skintight white jumpsuits and aviators. By eck. -Some more top-level jazz musicians playing abstract music with constant rhythmic and textural progression. By turns beautiful and frightening. -Where shoegaze, drone and post-rock meet free jazz and improv. Immersive, emotive soundscapes. -'Tardcore skronk merchants with interlocking guitar lines, cycling drum patterns and a bit of good old-fashioned shouting. Afterwards DJ Phurious Phil and Ellis will be serving dollops of dubstep, techno, 2-step, breakcore, whatever. Cheap bar with real ale, lager, wine, spirits, cider, unicum (?!) etc. Both from Milton brewery, Cambridge. Many other beverages also available. i would expect the other bands to be worth catching too. Have a crack at 'em on the Myspazz!